For lunch, 71% of women prepare lunch at home 3+ times per week. Twenty-one percent of women said that they prepare lunch at home every day, and 15% said they never prepare lunch at home. Among those who do prepare lunches at home, 28% do so 3-4 times per week, 22% make lunch at home 5-6 times per week, and 15% prepare lunch at home 1-2 times per week. 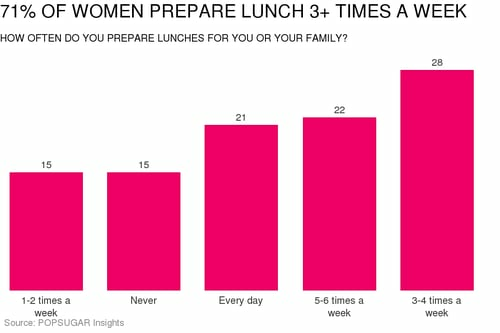 When not preparing lunch at home, we were curious where women decide to eat out for lunch. Among quick-service restaurants or fast-casual brands, Subway ranked number one overall with 1 in 5 women choosing to eat lunch at the popular sandwich shop. Ten percent of women said they grab lunch at Starbucks, and 9% of women said they head to Taco Bell for lunch. Among the 12% of women who said they eat at a fast-food restaurant not individually named in our study, the most popular "other" response was Chipotle.